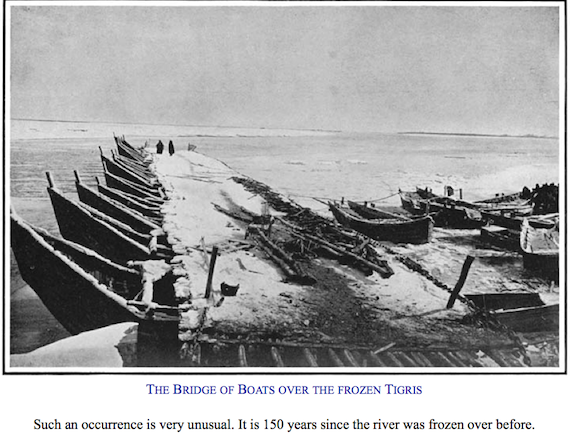 The authors say locals in Mosul told them that the last time the river froze was 1750. That freezing became more rare after that date is significant, since 1750 marks the beginning of the Industrial Revolution and increased coal burning for energy. The period 1250-1850 or the medieval cooling period (often incorrectly called the ‘little ice age’) saw cool temperatures in many parts of the world. By 1850 enough carbon had been put into the atmosphere by human beings to start the world on rapid global warming. Freak cold snaps such as the 1903 freezing winter in Mosul are weather, not climate. The daily weather is complex, but climate is the statistical record of changes over decades.